In this Guitar Control lesson video, Instructor John Maclennan is going to show you how to play Sweet Home Alabama intro on guitar. This song is great for beginners but it also has some ridiculously awesome guitar playing on it! In this lesson john is going to slow this song down, explain it, and breakdown some of these licks. The first step in learning how to play the Sweet Home Alabama intro on guitar is to learn the chords. The opening rhythm part is based of of three chord structures. A D5, a Csus2, and a G. All played in the open position. There are also many more useful first chords to learn on guitar when you are starting out. The way that John plays these chords is for the D5, he makes a normal D major shape, open 4th string, pointer on the 3rd string 2nd fret, ring finger on the 2nd string 3rd fret, and middle finger on the 1st string 2nd fret. But to make the D major become a D5 all that he does is leave off the middle finger that was holding down the 1st string 2nd fret and just leave out that string all together. This changes the D major to a D5 power chord in the open position. To play the Csus2, he actually just uses two fingers. He has his second finger on the 5th string 3rd fret and his third finger on the 2nd string 3rd fret. He is arching his second finger but lets it just barely touch the 4th string to mute it. Do not press it down on the 4th string, we do not want to hear that note ring out, but we do what to hear the rest of the open strings ring out. Just not the 6th or 4th string for this chord. Then to play that G, John moves his middle finger up one string, holding down the 6th string 3rd fret and just barely muting the 5th string, just like you did for the Csus2. So for the G you are pushing down the 6th string 3rd fret with your middle finger, you are muting the 5th string with your middle finger, paying the open 4th and 3rd strings, pushing down the 2nd string 3rd fret with your ring finger, which you never moved from any of these chords, that note has always been constant in all three chord structures, and you are playing the open 1st string. If you are enjoying this intro lesson also be sure to check out our other lesson on how to play Roy Orbison’s Pretty Woman on guitar, for another awesome riff to add to your repertoire. To start this riff off you are going to start with your open D5 chord, you are palm muting the open 4th string and you play it twice. The open 4th string is a D note, so two open D’s. Then keeping that D5 power chord shape you are going to pick the 2nd string, which you are holding down on the 3rd fret with your ring finger, and then the 3rd string, which you are holding down with your pointer finger, and then back to the open 4th string one more time. Then you go to that Csus2, taking your pointer finger off the fretboard and moving your middle finger up to the 5th string 3rd fret. Now you are going to play the root twice, just like we did for the D5 chord. So pick the 5th string 3rd fret twice. Then while holding down this shape, pick the 2nd string, then the 3rd string, and then the 4th string. Now move your pointer finger up to the 6th string 3rd fret, leaving your ring finger where it is, holding down the 2nd string 3rd fret and now you are playing a G. Pick your root twice again, just like you did for both of the other chords, so pick the 6th string 3rd fret twice, then pick the open 3rd string once. Follow along at the 2:10 mark to see John play through this slowly. We follow this rhythm with a fill. The first fill starts with an open 5th string, then hammer onto the 2nd fret 5th string using your middle finger. Then pick the 4th string open and hammer onto the 2nd fret 4th string and then pull off back to the open 4th string. Then go back to the 5th string 2nd fret but this time use your pointer finger. Then reach down to the 3rd string with your second finger and play the 2nd fret once and then pull off to the open 3rd string. To see John play through this fill slowly, go to the 2:58 minute mark. Now go and repeat the opening rhythm again. However this time we have a different fill, or different ending. However you want to think of it. This time we are going to be doing an ascending likc all on one string and you can even do the whole thing using just one finger. So all on the 3rd string, start with two opens, so pick the 3rd string open twice. Then pick the 3rd string 2nd fret and pull off back to the open string. Then pick the open string again, then playing the 4th fret and pulling that note off to zero, to the open 3rd string, then pick an open 4th string, just once. And end it with bending the 5th fret 3rd string. John used his second finger the whole time for this fill, you can of course use whatever finger is the most comfortable for you. And that is the entire intro! All based off just those three chords. I hope you enjoyed learning how to play Sweet Home Alabama intro on guitar. This is such a great song and riff and a great one for the beginning guitarist and guitarist at any level to use. It’s also great for seeing how to play fills off of chord shapes and to get started with chord changes that have similar notes. 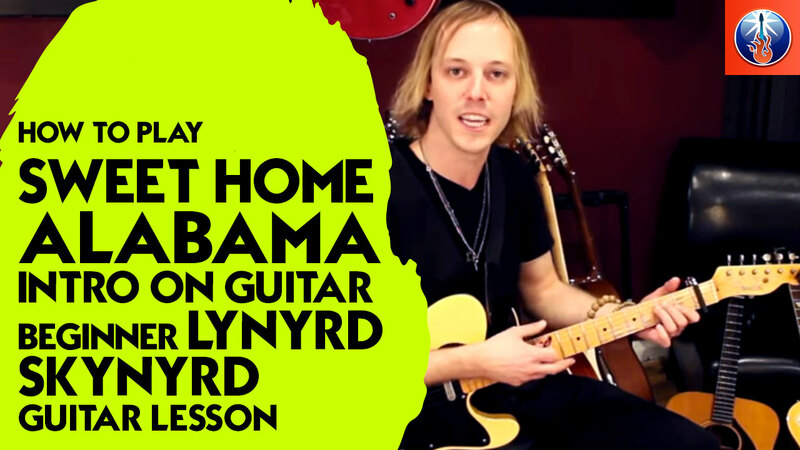 Use this lesson not only as a lesson in learning how to play Sweet Home Alabama but also as a lesson in writing fills and making simple chords cool by arpeggiating or changing them up a bit. Bring all of these elements into your own playing and of course, as always, have fun! How To Play “Eastside” By Benny Blanco, Halsey & Khalid – Cool Pop Guitar Lesson With TABs!